There are more examples of using parallel coordinates for the Tour de France at http://statisticalgraphics.blog.com/, including ranking, time per stage and cumulative time. The bailout lines do help show that the eventual winner owes his position somewhat to the disqualification of riders ahead of him (stages 15 & 16--did it happen twice? I can't remember) but there must be a more elegant way to indicate this. I'm a little surprised that the convention is for rank 1 to be at the bottom of the chart. I would have had the high ranks high. 1. The green jersey is the "points" leader. Points are given for reaching sprint finishes first, second, third, etc. These finishes can be at the end of a stage or somewhere during the middle. 2. Sprinters are typically not good climbers. As soon as the race hits the mountains, the green jersey holder is just trying not to get eliminated. 3. The complete redistribution of rankings is usually due to the stage or its format, not a team maneuver. The prologue (Stage 0) and Stage 13 were individual time trials (riders leave 1 or two minutes apart for a relatively short ride). Stage 5 was the first climbing stage. 7, 8, and 9 were in the Alps. 14-16 were the Pyrenees. 4. "Bailing out" can be because someone "crashes out" or they arrive at the finish too late and are then DQ'ed, or they just quit. It depends on the stage, but you have to finish within a certain percentage of the stage winner's time (eg. 150%). 5. I think the bail-out lines are useful because they indicate the position of the riders who bailed. The most important bail-out was after Stage 16, when the race leader was pulled from the Tour by his team after allegations he had dodged off-season drug testing. I agree that the bail-out lines are useful and important, but I fear that they might be constructed artificially by setting each bailing-out rider's next rank to some out-of-range value like 1000 for the stage after the rider bails out. That may be why they are not parallel. I think it might be better to simply remove the skyrocketing bail-out lines and mark the end point of each of those rider's lines with say a red dot or something to indicate where they were ranked when they left the Tour. Otherwise a very fascinating and educational chart. You are only eligible for the green jersey if you finish the race, so the green jersey winner has to stay in by definition -- you don't get the jersey if you drop out, even if you have the most points. Does anybody know where to find a reasonable data set of "General Classification" rank for each stage? The examples I got from a brief googling session were highly inconvenient, and mostly did not even include ranks lower than ten or fifteen. 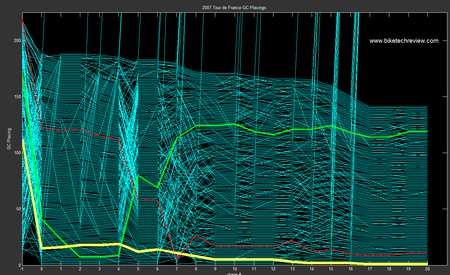 Might be interesting to include a small second graph along the X axis showing the profile of each stage - or even simply icons for stage type - time trial (individual race v. clock), mountain, or flat. 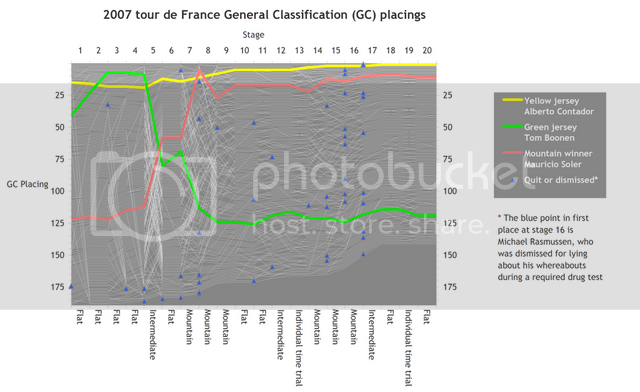 It could lend some quick explanation to which stages are the ones that re-organized the GC. Might also be fun to explore how to show which stage(s) the eventual jersey winners wore the jersey during the race and showing stage winners - perhaps both could be done by varying line weights? I blog about statistics too. I've linked to you. Hopefully you can link back. VeloNews has the stage-by-stage results. jb, I expect you meant me, not zbicyclist (it's a confusing effect of the design of the comments section that there is a line between the comment and the commenter, but only white space between the previous commenter and the next comment. It was velonews's list that I extracted in the end, but I have to say their professional consistency was appalling; the results seem to have been created anew by a different reporter every day, and they each had a different idea about how the list should be arranged, and what the names of the competitors were. Get a database you guys! * I marked the riders who quit or were canned by a blue marker instead of the shooting lines. It's now much easier to count them and note their rank at the stage they left. * I labelled the stages with flat, mountain etc. Unusually, I chose a dark background, because I couldn't think of an alternative to the iconic convenience of yellow line=yellow jersey. Derek: excellent effort! I also like 9.2.5's idea of combining it with a "relief map" of the course. This addition reminds me of the famous Napoleon Russian campaign map.